When Harrison & Star group account supervisor Martin Doheny brought an inflatable Bozo the Clown bop bag to his company holiday party, it was a total hit. “We called it our extra team member,” said assistant account executive Michael McSwain. Bozo drifted from office to office, and occasionally sat through meetings, before people generally lost interest and he found himself sitting alone in the window of colleague Beth Owens’s office. “There’s a high-rise going up across the street, and we thought the construction workers would like seeing Bozo when they were pouring concrete or whatever,” McSwain explains. 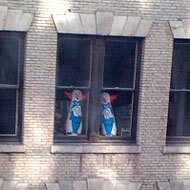 And so Bozo was sort of forgotten for a while, staring emptily out onto West 22nd 21st Street. Within a week, a second Bozo appeared beside him. Workers from Harrison & Star investigated the lobby of the building across the street and discovered that the floor in question was occupied by a company called VideoHelper. From that point forward, McSwain says, the entire office “treated the Bozo payback initiative like any other client project.” Brainstorming meetings were held; ideas flew back and forth over e-mail on how to retaliate (“Sniper — take one out,” suggested one senior vice-president). After much discussion, Doheny and his higher-ups decided on the size of the surge — one Bozo in each window, two floors only, so there’d be room for a larger surge later if necessary — and tasked their team with gathering up the Bozos needed. That maneuver is planned for Monday. 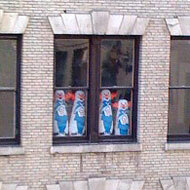 This morning, H&S workers were startled to see three Bozos in the window across the street. And, then, shortly after, a fourth. But little do the pranksters of VideoHelper know that as of press time, the entire office of H&S is busy inflating and preparing a bop-clown army for Monday’s deployment. Anyone who happens to be walking past 16 West 22nd Street that day should check it out, and stay tuned to see how the office across the street responds.